^ a b c d e f g h i j Clifford M. Foust; Dale E. Marshall (1991). 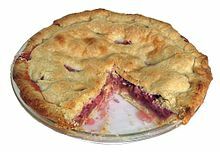 “Culinary Rhubarb Production in North America: History and Recent Statistics”. HortScience 26 (11): 1360-1363. http://hortsci.ashspublications.org/content/26/11/1360.full.pdf+html 2017年5月26日閲覧。. ^ a b c d e f g h i j k l m Danny L. Barney; Kim E. Hummer (2012). [Horticultural Reviews, 第 40 巻, p. 147, - Google ブックス “Rhubarb: Botany, Horticulture, and Genetic Resources”]. Horticultural Reviews 40: 147-182. Horticultural Reviews, 第 40 巻, p. 147, - Google ブックス 2017年5月28日閲覧。. ^ a b c Bo Libert; Roger Englund (1989). “Present distribution and ecology of Rheum rhaponticum (Polygonaseae)”. Willdenowia 19: 91-98. http://www.jstor.org/stable/3996925 2017年5月18日閲覧。. ^ a b c d W. T. Stearn (1974). “Rhabarbarologia: Rheum Rhaponticum, an Endangered Species?”. GardenHistory 2 (2): 75-76. doi:10.2307/1586461. http://www.jstor.org/stable/1586461 2017年5月18日閲覧。. ^ a b Joseph C. Kuhl; Veronica L. DeBoer (2008). “Genetic Diversity of Rhubarb Cultivars”. Journal of American Society for Horticultural Science 133 (4): 587-592. http://journal.ashspublications.org/content/133/4/587.full 2017年5月14日閲覧。. ^ a b c Dale E. Marshall (1988). “A Bibliography of Rhubarb and Rheum Species”. Bibliographies and Literature of Agriculture (62). https://catalog.hathitrust.org/Record/007420496 2017年5月13日閲覧。. ^ Necia Parker-Gibson (2013). “Review of World Economic Plants: A Standard Reference”. Journal of Agricultural & Food Information 14 (3): 262-263. doi:10.1080/10496505.2013.803435. ^ a b John H. Wiersema; Blanca León (2016). [World Economic Plants: A Standard Reference, p. 583, - Google ブックス World Economic Plants: A Standard Reference] (Second Edition ed.). CRC press. p. 583. World Economic Plants: A Standard Reference, p. 583, - Google ブックス. ^ a b c d e f g h i j k l m n o p q G. J. H. Grubben (2004). [Vegetables - Google ブックス Vegetables]. Plant resources of tropical Africa. PROTA. pp. 446-449. Vegetables - Google ブックス 2017年5月21日閲覧。. ^ a b John Uri Lloyd (1921). Origin and History of All the Pharmacopeial Vegetable Drugs, Chemicals and Origin and History of All the Pharmacopeial Vegetable Drugs, Chemicals and Preparations with Bibliography. 1. ISBN 978-1-4086-8990-5. https://books.google.com/books?id=apAPal8iAxgC&pg=PA270. ^ Warmington, E. H. (1928). The Commerce Between the Roman Empire and India. Cambridge: Cambridge University Press. p. 207ff. ISBN 978-1-00-136124-6. https://books.google.com/books?id=u9w8AAAAIAAJ&pg=PA207. ^ a b c d Monahan, Erika (2013). “Locating rhubarb”. In Findlen, Paula. Early modern things: objects and their histories, 1500-1800. Abingdon: Routledge. pp. 227–251. ISBN 978-0-415-52051-5. ^ a b Christopher Stocks (2009). [Forgotten Fruits, p. 192, - Google ブックス Forgotten Fruits: The stories behind Britain's traditional fruit and vegetables]. Random House. pp. 192-199. Forgotten Fruits, p. 192, - Google ブックス. ^ a b c Andrew Smith, ed (2012). “Rhubarb”. Oxford Encyclopedia of Food and Drink in America. 3 (2nd ed.). Oxford University Press. pp. 135-136. ^ BBKA News (The British Beekeepers' Association) (209): 5. (2013). ISSN 2051-0624. ^ a b Bill Neal, "Biscuits, Spoonbread and Sweet Potato Pie", p. 308 (Chapel Hill, N.C.: University of North Carolina Press, 2003; originally published in a different edition in 1990). ^ P. A. Williams et al. (2005). “Chilean rhubarb (Gunnera tinctoria); biology, ecology and conservation impacts in New Zealand”. DOC Research & Development Series (210). http://www.doc.govt.nz/Documents/science-and-technical/drds210.pdf. ^ a b Barceloux, Donald G (7 March 2012). Medical Toxicology of Natural Substances: Foods, Fungi, Medicinal Herbs, Plants, and Venomous Animals. John Wiley & Sons. p. 235. ISBN 978-1-118-38276-9. https://books.google.com/books?id=aTTBPedwFfAC&pg=PT235 2013年8月5日閲覧。. ^ Chevallier, Andrew (2000). Natural Health: Encyclopedia of Herbal Medicine. New York, New York 10016: Dorling Kindersley. pp. 127. ISBN 0-7894-6783-6. ^ Oxford English Dictionary s.n. rhubarb, n.
^ Basile, Adriana; Rigano, Daniela; Loppi, Stefano; Di Santi, Annalisa; Nebbioso, Angela; Sorbo, Sergio; Conte, Barbara; Paoli, Luca et al. (2015-04-09). “Antiproliferative, Antibacterial and Antifungal Activity of the Lichen Xanthoria parietina and Its Secondary Metabolite Parietin”. International Journal of Molecular Sciences 16 (4): 7861–7875. doi:10.3390/ijms16047861. ISSN 1422-0067. PMC: 4425054. PMID 25860944. https://www.ncbi.nlm.nih.gov/pmc/articles/PMC4425054/. ^ Huskinson, B; Marshak, MP; Suh, C et al. (9 January 2014). “A metal-free organic-inorganic aqueous flow battery”. Nature 505 (7482): 195–198. doi:10.1038/nature12909. PMID 24402280. ^ “Rhaponticin from rhubarb rhizomes alleviates liver steatosis and improves blood glucose and lipid profiles in KK/Ay diabetic mice.”. Planta Med. 75: 472–7. (April 2009). doi:10.1055/s-0029-1185304. PMID 19235684. ^ Robb, H. F. (1919). 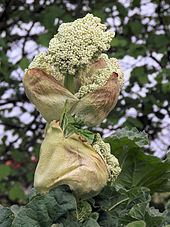 “Death from rhubarb leaves due to oxalic acid poisoning”. J. Am. Med. Assoc 73: 627–628. doi:10.1001/jama.1919.02610340059028.